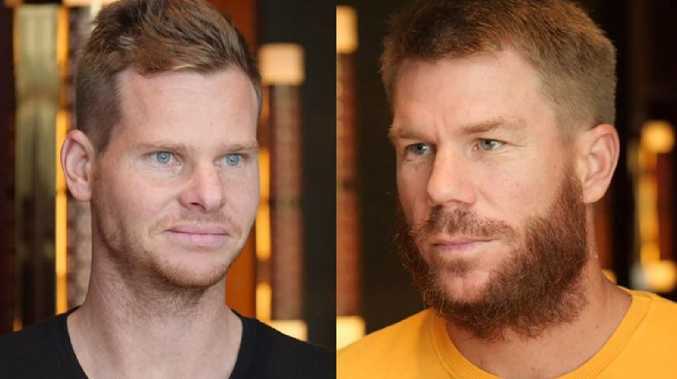 Steve Smith and David Warner have been named in Australia's World Cup squad. Steve Smith and David Warner have been officially welcomed back to the international fold after winning World Cup selection. The official squad was announced on Monday morning, with Smith and Warner's inclusions sure to draw most attention in Australia's 15-man squad to travel to England. Peter Handscomb was the unlucky batsman to make way for Smith, despite the Victorian playing in Australia's past 13 ODIs. In what came down to a straight pick between Handscomb and Shaun Marsh, selectors have gone with the more experienced head, reward for being Australia's leading ODI batsman over a troubled two year period for the team. Marsh, 35, has made seven one-day centuries - including two on the side's most recent tour of England - and is close with Langer. Despite an explosive showing in a match winning knock in Ranchi, Ashton Turner has also been squeezed out by the return of the previously banned duo. Injured Test seamer Josh Hazlewood (back) was the other big name to miss out. CA wants to keep him fresh for the Ashes, with the first Test starting 18 days after the World Cup final. Hazlewood has resumed bowling off a couple of steps and recently declared himself fit for the World Cup. 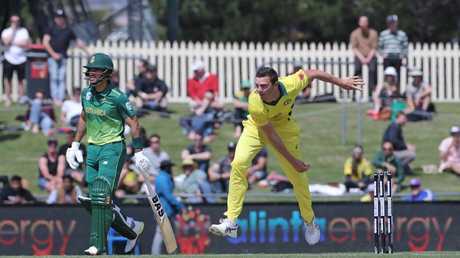 His omission opened the door for Western Australia pair Jason Behrendorff and Nathan Coulter-Nile to round out the pace battery. Adam Zampa and Nathan Lyon travel as Australia's spin options. Powerbrokers are confident the returns of Smith and Warner would not disrupt the momentum of a one-day team that has posted eight consecutive wins. Josh Hazlewood declared himself fit duty, but has been given more time to rest before the Ashes. While Warner was always an automatic selection given his rich form in the Indian Premier League, Smith, remarkably, appeared for a time in danger of missing the World Cup squad. The former captain has attempted just one throw in the IPL, with his sore elbow still a long way from healing. But coach Justin Langer will now have arguably his two best batsmen in England for Australia's World Cup defence, which begins on June 1 with a group match against Afghanistan. The group will meet for a training camp in Brisbane in May, the first time Warner and Smith will pull on Cricket Australia kit since their shaming at Newlands. Australia will play practice games against New Zealand on May 6, 8 and 10 as part of the camp. Australia is happy to back Alex Carey as the sole wicketkeeper. If Carey breaks down then Australia could rush in Handscomb, given he will be in England for the Australia A tour. Test captain Tim Paine and fellow keeper Matthew Wade will also be nearby with Australia A as potential insurance for Carey, along with fringe players Sean Abbott, Kurtis Patterson, Joe Burns, Mitchell Marsh and Kane Richardson. The other ball tampering culprit, Cameron Bancroft, will also be in England given he is captaining county side Durham. Australia had until next Tuesday to submit its World Cup squad with the ICC but finalised its plans last week. Injured bowlers Jhye Richardson (shoulder) and Mitchell Starc (pectoral) have both been deemed sufficiently down the track with their recovery to justify inclusion.